We at Oolite Arts, like all who live and work in Miami Beach, feel the effects of rising tides regularly. For us, it’s not a future challenge, but one we are living today. 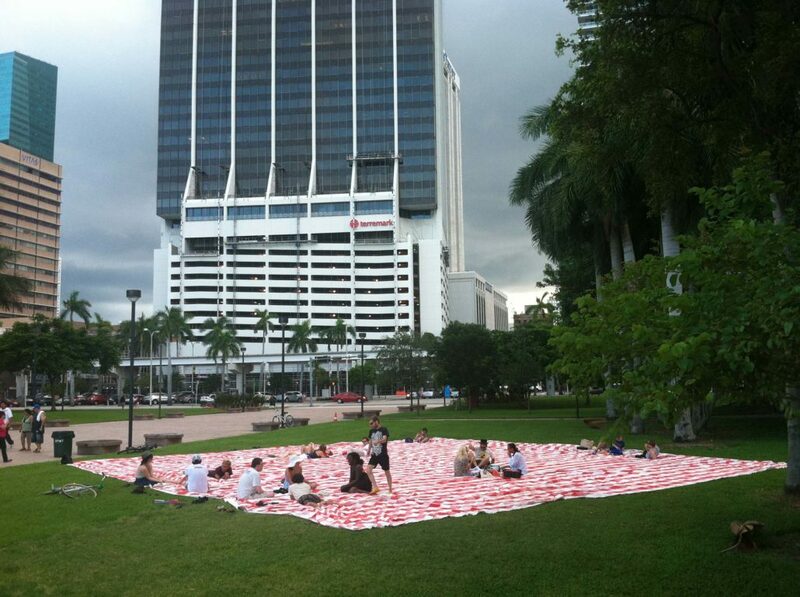 The City of Miami Beach is being proactive in addressing it. Yet such a large-scale issue demands input from all of us – including our artists. Our first Art in Public Life resident, Misael Soto is providing that perspective, spending a year embedded in the city to both develop artworks and public programs while offering a fresh, creative perspective on the city’s resiliency plan. You can read more about Misael and the residency below. Artists deserve a seat at the table, to contribute their ideas and shape solutions to our pressing issues. We’re delighted to have Misael in Miami Beach this year to contribute. Artist will help City of Miami Beach address sea level rise with new Oolite Arts residency. Oolite Arts and the City of Miami Beach have named their first Art in Public Life resident, who will provide a fresh perspective in helping the city address the challenge of sea level rise and improve its overall resiliency. 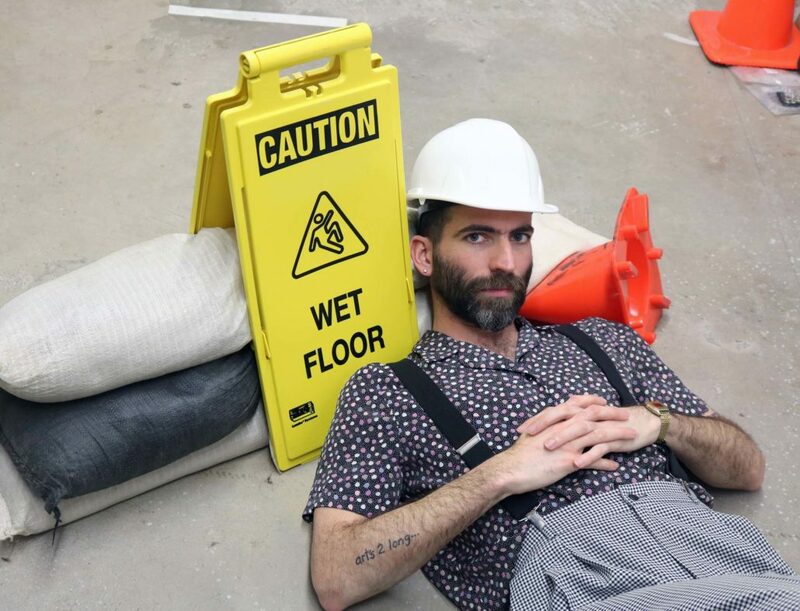 Visual Artist Misael Soto, who recently received a Master of Fine Arts degree from the School of the Art Institute of Chicago, will work both at City Hall and in a studio at ArtCenter. 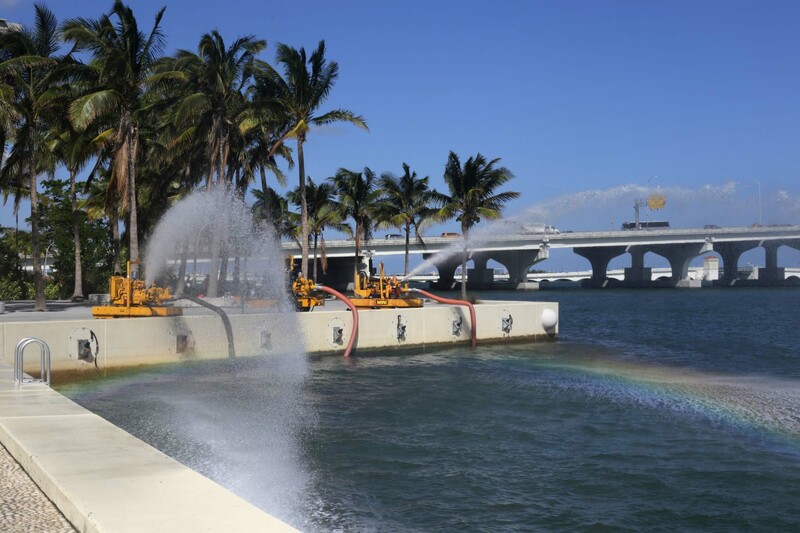 Soto was chosen because of the their approach to involving the community in new works, including in the November exhibition “Flood Relief.” The installation on the Downtown Miami bayfront, commissioned by Miami-Dade Art in Public Places, used giant flood mitigation pumps, and performance events surrounding them, to create a spectacle that urged people to explore flood mitigation efforts. The program is supported in part by the John S. and James L. Knight Foundation’s Knight Arts Challenge, which funds the best ideas for bringing South Florida together through the arts. Over the next year, Soto will be embedded in the City of Miami Beach, working directly with the City’s Director of Environment and Sustainability as the City develops climate adaptation and mitigation programs and strategies. Miami Beach is proactively addressing sea level rise, its economic and social consequences, and other challenges faced by many cities in the 21st century. The city is investing $500 million to raise roads and install pumps to protect the island and the people who live there, and is also developing a comprehensive resiliency strategy. Soto plans to attend meetings, provide input, and, through art, bring the community into the process. “Miami Beach residents have seen the effects of sea level rise first hand. A problem this complex demands attention and solutions from all corners of our city. We’re excited to have Misael on board to help us reach more people and to harness creativity on the issue,” said Miami Beach Mayor Dan Gelber. Oolite Arts will work closely with the artist on the implementation of programming and art works throughout the residency period. “This residency is a way for me, an artist, to get into the room with those who are making the decisions that affect people on the ground daily and contribute in multiple ways, primarily through my art,” Soto said. Soto has exhibited at MCA Chicago, Open Engagement 2015, the Museum of Contemporary Art in North Miami, Material Art Fair in Mexico City, David Castillo Gallery in Miami and the Museum of Art Fort Lauderdale, among others. Council; the National Endowment for the Arts; and the John S. and James L. Knight Foundation. With an average year-round temperature of 75 degrees, Miami Beach blends the pleasures of a tropical island with that of a sophisticated metropolis. The 7.2 square mile urban-paradise is the pulse of South Florida. From walkable neighborhoods, white, sandy beaches, clear aquamarine waters, and an extensive park system to its rich Art Deco and MiMo history, fine dining, and diverse and unique entertainment and cultural offerings. Miami Beach is where everyone wants to come to live, work and play. It is home to unique museums, the New World Symphony and Miami City Ballet, over 17,000 luxury, boutique and resort hotel rooms, 12 public parks, and the Miami Beach Convention Center. On the front lines of climate change, Miami Beach is often hailed to be writing the book on sea level rise adaptation and mitigation through its estimated $500 million stormwater infrastructure plan, which includes the aggressive installation of stormwater pumps, raising roads and elevating sea walls citywide.